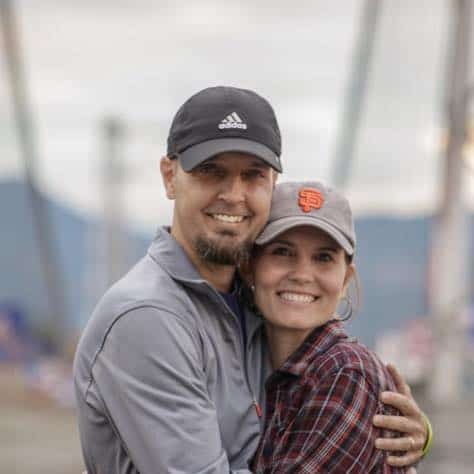 Our RV adventures began about two months before we made our way to Banff National Park outside of Calgary, Alberta in July 2017. On our trip north from Texas, we had already laid eyes on the stunning grandeur of the Rocky Mountains, the dramatic rise of the Grand Tetons from the Wyoming landscape, the breathtaking serenity of Lake McDonald in Glacier National Park and so many other soul-altering sights. 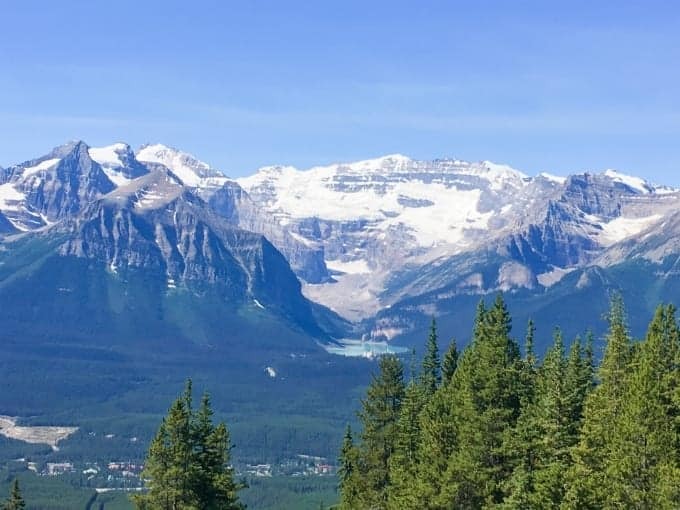 You would think that we might be “mountained out” or hitting a “nature overdose” that would impact our experience in Banff, possibly stealing some of the magic of the place. From the moment we left our RV park in Calgary heading toward Banff and began our ascent into the Canadian Rocky Mountains, we knew we were in for something very unique. Of course, being foreigners in this place, we expected uniqueness around every corner. But the scope and scale of the peaks that came into view as we meandered through the valleys were simply overwhelming. And when we pulled up to our Canmore Airbnb “home” for the next few days, walked to the front door and turned around to enjoy the view from the front porch…the only response was silence as grand peaks towered over our perfect accommodations. 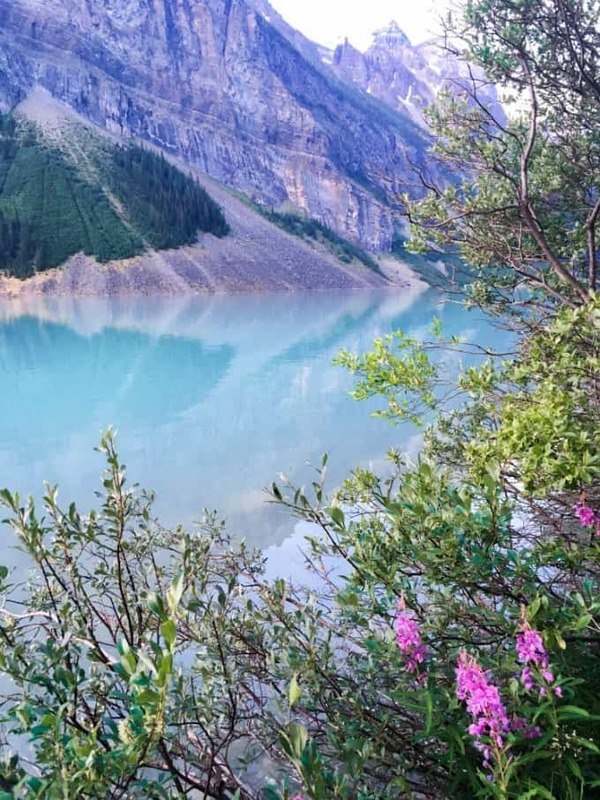 Our precious few days (yes, it really should have been more) in Banff National Park, as Canada celebrated its 150th year, were everything we had hoped for. Despite fires burning in the area and some heavy smoke settling in at times, we found the experience simply awe-inspiring. We took a ski lift ride up to a peak that sat opposite Lake Louise and the majestic range that engulfed her. And on the way up? 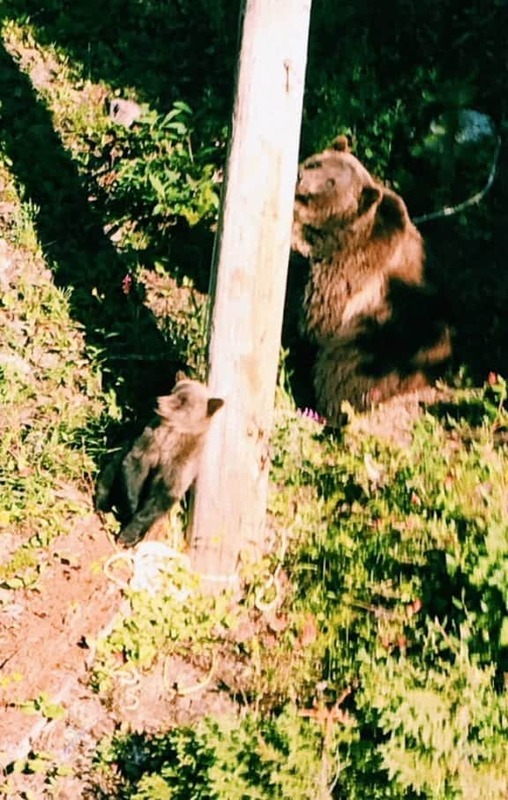 A momma Grizzly and her cub lazily meandered through the open meadow 30 feet below our dangling legs. They seemed serene and content and completely unaffected by our (slightly) obnoxious cellphone-wielding presence. At the top of the peak, we enjoyed an incredible meal on the deck of the Whitehorn Bistro as we soaked in as much of this view as we possibly could. We found it simply spectacular in every way. But the highlight of the Banff National Park visit for me? The experience that really sent me over the top into sheer ecstasy? The Plain of Six Glaciers hike with my two boys. And yes, it took us directly to a remote tea house sitting on the slope of a mountain where food and supplies had to be airlifted in by helicopter. Amazingly, we actually witnessed this process during our time at the tea house. Nothing in my nature adventures of the previous 42+ years could rival the combination of factors that came together on that picture perfect Canadian day in July. Nothing. 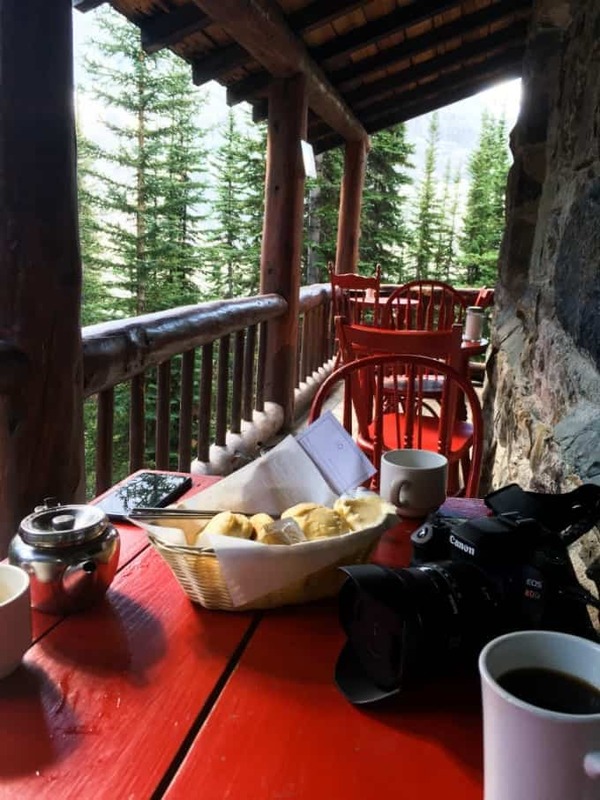 After a little over four miles of fairly intense hiking and witnessing the beauty of multiple glaciers along the way, the three of us eagerly sat ourselves down in bright red, wooden chairs on the narrow outdoor deck of the tea house. We sat there among the emerald treetops, in the middle of absolutely nowhere. A perfectly simple meal of earl grey tea, coffee and steaming, fresh biscuits with butter and strawberry jelly sat before us. We slowly breathed in the cool, pristine morning air of this sacred place. Gratitude overwhelmed me in that moment. I lost all my words and the reality of all that this moment held washed over me as I slowly sipped the hot coffee in front of me. My soul seemed to expand beyond my mental constructs, just barely touching on the reality of the bigger and more beautiful story going on all around me. It was the story that somehow created a tiny and surprising oasis like this and brought people from all corners of the world to serve here and to enjoy it. And I felt utterly and thankfully dwarfed by that story. I would have gladly extended the joy and awareness of that moment for as long as possible. But with more than four miles of trekking left in front of us to return to the trailhead near the shores of Lake Louise, we had to get moving. With most of the journey being a not-too-intense downhill trek, we made it back in record time. We completed our 8.5 mile journey by late morning with bodies healthy(maybe a couple of sore knees) and spirits high. During the hike back down, we saw many other adventurers ranging in age from 5 to 85. Based on our experience, however, I can’t confidently recommend this particular hike for children under 10-12 years old in general. If you are prepared for a very slow pace or some child-packing, you may give it a go with some younger ones. 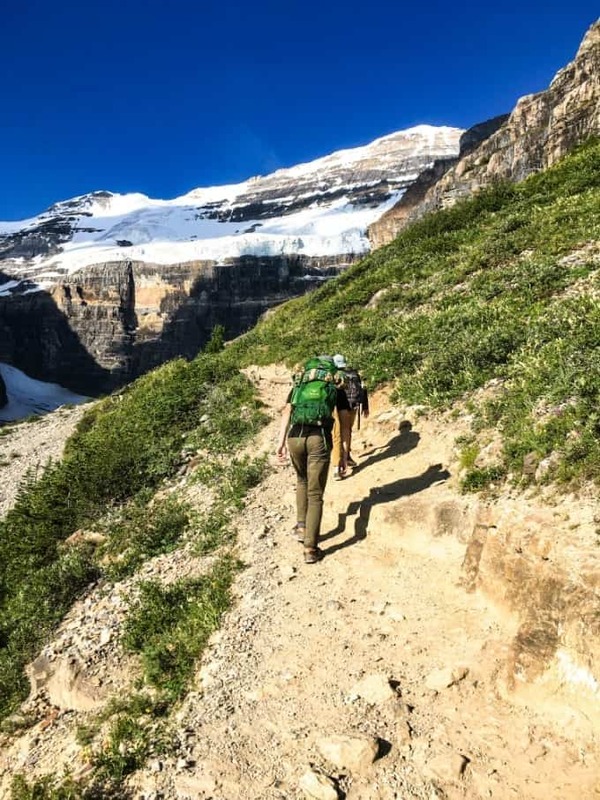 I truly hope you get the opportunity soon to experience the wonder and serenity of the Plain of Six Glaciers trail in Banff National Park. You’ll never forget the tiny tea house, and the awareness, that awaits you at the top. 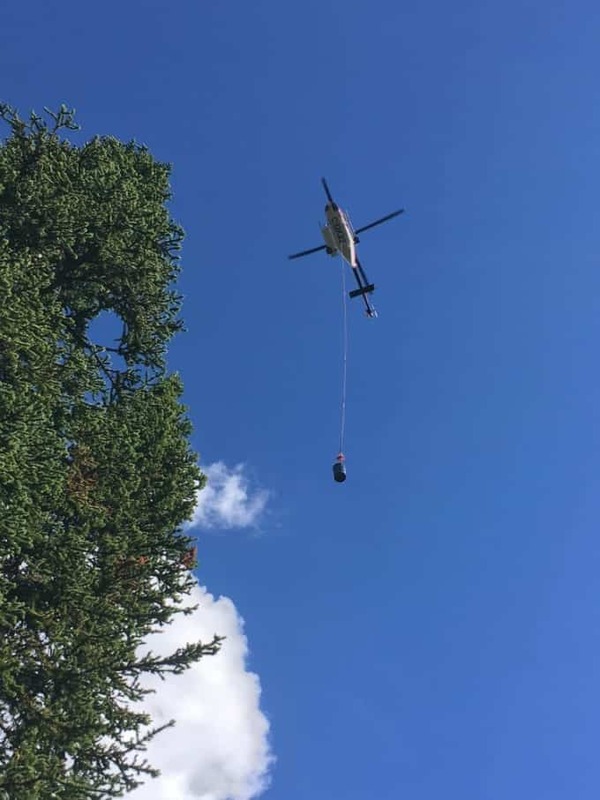 Hiking isn’t the only activity to do in Banff. 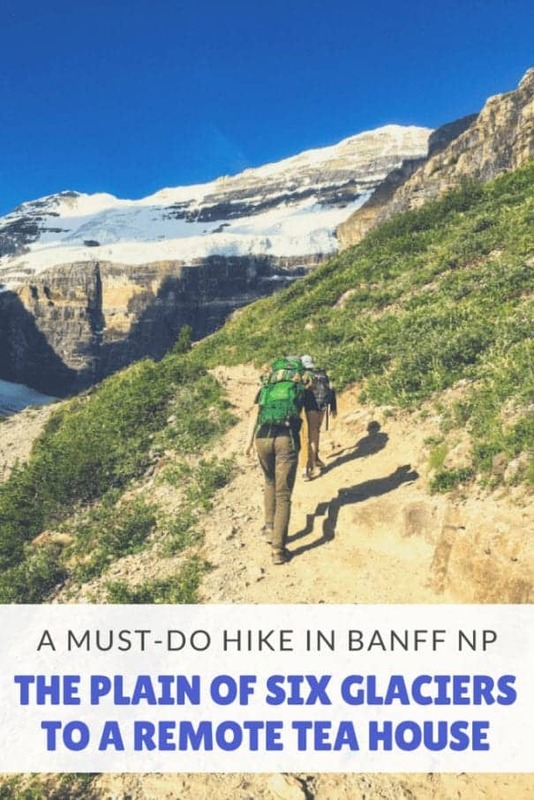 For a list of both summer and winter activities, be sure to check out this post from Must Do Canada titled ‘Best Things To Do in Banff National Park, Canada.’ Next time we go back, I am definitely checking out a helicopter tour.